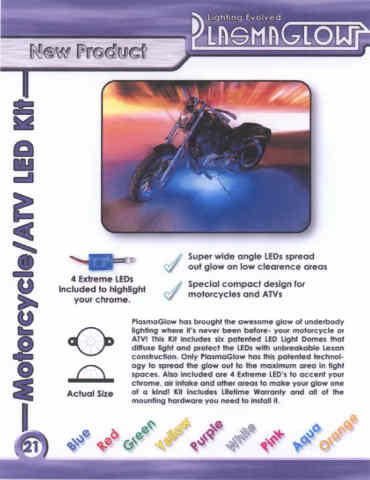 Motorcycle Underglow Kits for your Bike or ATV. 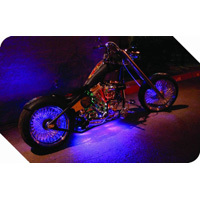 Motorcycle Underglow kits for all types of Bikes and ATV's. PlasmaGlow has brought the awesome glow of underbody lighting where its never been before- Great for Motorcycles and ATV's! 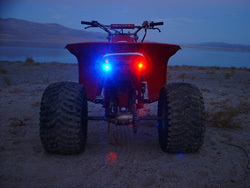 This LED atv underglow kit is made up of six patented LED Light Domes that diffuse light and protect the LED's with unbreakable Lexan construction. Only PlasmaGlow has this patented technology to spread the glow out to the maximum area in tight spaces. You also get 4 Extreme LED's to accent your chrome, air intake and other areas to make your glow one of a kind! The Motorcycle underglow kits include a Lifetime Warranty, instructions and mounting hardware to ensure a smooth installation. You can mount the LED Dome lights under your bike frame so that the glow is concentrated directly onto the road beneath you. Or you can install the underglow LED lights under the Gas tank so the glow highlights all the chrome components and engine on the motorbike. When it comes to ATV's - you can put 2x dome LED's under the bike, 2x in near the engine and 2x on the back of the atv - the possibilities are endless! 6 LED Domes for under motorcycle/ATV each measure 1" x 1"
4 Extreme LED's to light up Chrome. Want the ability to control this kit from up to 500 feet away? Then get the 12V Remote Controller NOW! 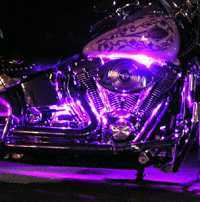 Motorcycle Underglow Kits- Back to Home Page.